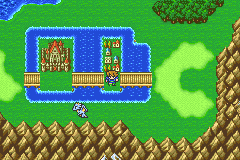 - Your next major destination is the kingdom of Walse, located to the southwest of North Mountain. You’ll find a town next to a Castle. We’ll have a look at the town first. - Despite all the walking you can do down in the water surrounding this little town, there’s nothing to be found outside. The house in the southwest, accessible via the water, contains Silver Specs in a pot; and… that’s all, honestly. Yep, kind of boring. - Despite the lack of items Walse is still worth the visit because of the items. There’s more gear in the weapon and armour shops which will help along your Knights in particular. More interestingly, though, you’ll find a slew of spells in the magic shop (east side of town, through the trees) that none of your jobs can currently use. Hmmmm! Might you be getting some more jobs soon? Yes, you might just. Buy them now or not, it’s your choice. - Head to the throne room to get the compulsory stuff over with first. It’s straight north. Triggering this cut scene will open up a dungeon to the northeast. - Now to wander around the Castle. It’s not that big, despite how it looks. Reenter the lobby and go through the door to the right. It leads to a connecting room, and on your right a set of stairs to a Storehouse. Inside you’ll find a Tent, a Phoenix Down, and 490 gil in the crates, barrels, and jars. - Down the stairs in the lobby you’ll find another room that leads in several directions. The stairs on your left lead to a dungeon; inside you’ll find a dude named Lone Wolf who will ask you to let him out. Don’t. You get nothing for it immediately, and later on he’ll steal a number of chests from you. - Head back to the split room and go south. There’s a door leading to the Castle’s outer walls, and from here you can travel through the waterways to your right. Travel north and you’ll find a large waterfall; you can step into it to find a hidden tower. This four-floor area is patrolled by enemies, but they’re not that much tougher than what you fought outside. Make your way to the top of the tower and you’ll find a boss waiting. This is a tough fight if you try it upon first arriving in Walse. Shiva spends most of the battle casting Blizzara, and she’ll do it to either a single target for roughly 180 points of damage or multiple for about half that. This is manageable at your probably current level - but the difficulty is compounded when you add in the three Ice Commanders that help Shiva. They’re appreciably hardy, and can smack you around pretty well. Target each of the Commanders in turn to wipe them out one-by-one, using strong physical attacks (Monks are ideal) and any fire spells you have. So, y’know, Fire. Once they’re gone, focus all your attacks on Shiva herself. One character should probably be Curing the entire party each round, at least until the Commanders are dead.